I would have pancakes every weekend if I could but I like to have mine with dollops of whipped cream and maple syrup so I have to save them for special occasions. However, I want my son to be able to enjoy pancakes as a weekend treat and something to look forward to, so I went on a mission to find an awesome paleo pancake recipe and this is it. These are light, fluffy and delicious. You can choose to serve with the blueberries or chocolate chips if you're wanting to make it a bit fun. 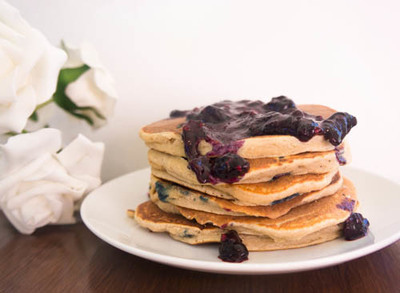 Now, pancakes don't have to just be for special occasions! In a large bowl, whisk the eggs together. Add the almond milk, maple syrup, lemon juice and vanilla extract and combine. In a separate bowl, mix the coconut flour and tapioca flour together and add to wet ingredients a 1/4 cup at a time, whisking as you go. Add baking soda, baking powder and salt. Heat a non-stick fry pan over a medium heat. Ladle in a spoonful of batter and drop a few of the blueberries on top. When the mixture starts to bubble, flip the pancake over and cook for a minute on the other side or until golden brown. Put pancakes on a plate as you cook them and keep under a tea towel to keep them warm. To make syrup, combine blueberries in a saucepan over low heat until the juice start running. Add a little water if needed and cornflour to thicken the syrup. 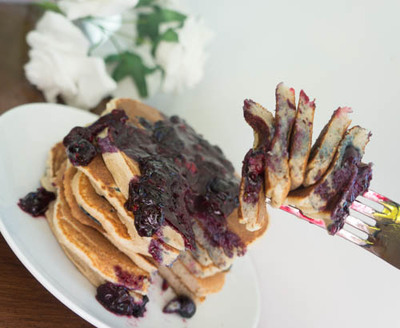 Pile up a few pancakes on your plate, pour over some of the blueberry syrup and dollop some cream on top! Gobble up! Recipe from Civilized Caveman Cooking blog.